How nice to have a lovely breakfast in the B&B. I had a homemade haddock fish cake topped with poached egg. Delicious. 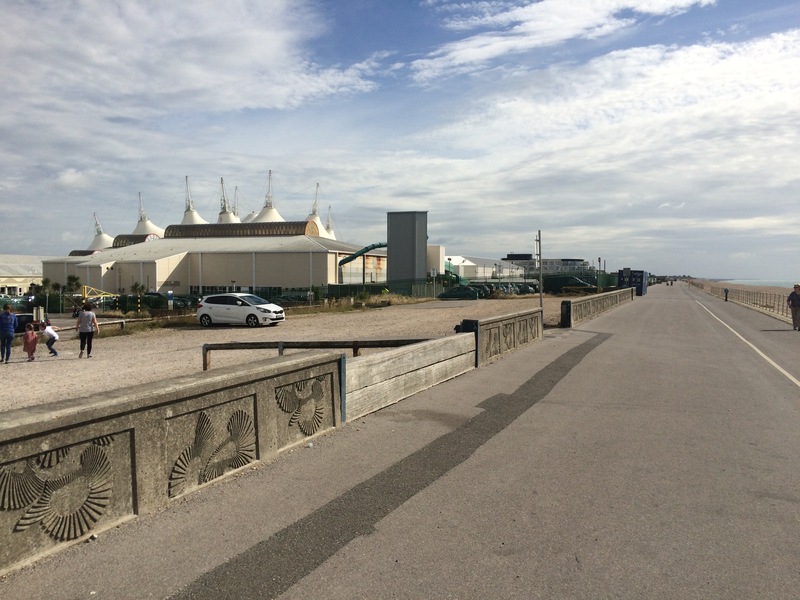 I set off with a spring in my step to walk the rest of the way along Bognor Regis seafront, past the pier and the famous Butlins holiday camp. Unfortunately I was a month too early for the Bognor International Birdman competition (i.e. jumping off the end of the pier wearing fancy dress). 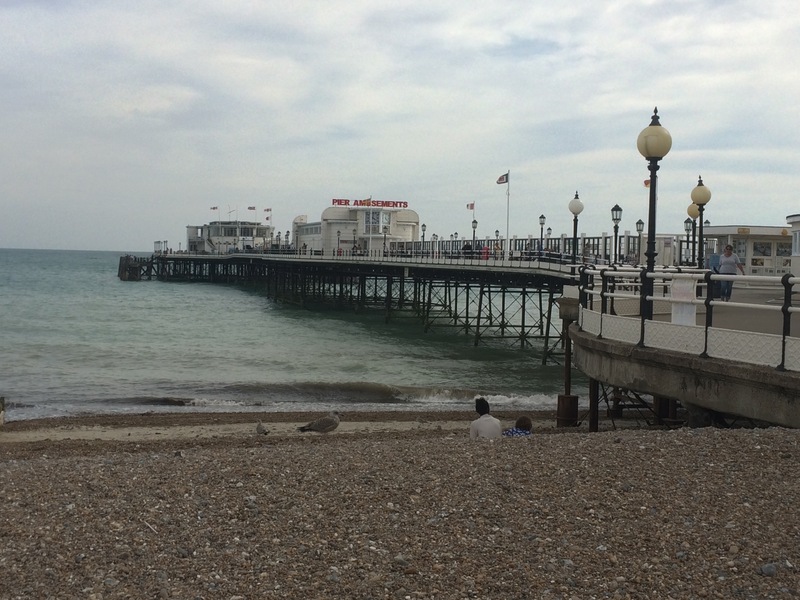 Bognor’s pier – perfect for jumping off in a flying machine! The East side of town was not so plush but I still thought Bognor was a lot nicer than its name sounds. The seafront was nice. A lady told me the beach used to be sandy until several years ago when the groynes further West were removed and now the beach is shingle. 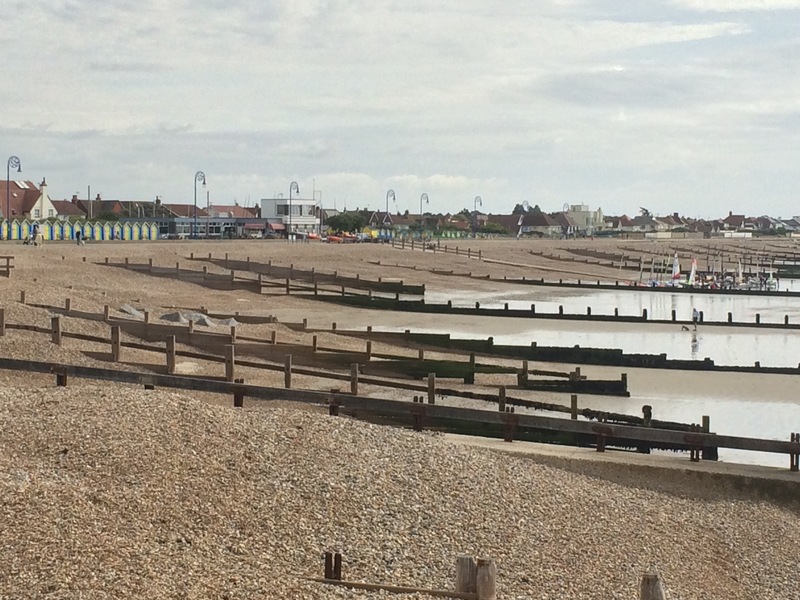 Bognor morphed into Felpham and then Middleton-on-Sea. Felpham in particular looked nice; a nice beach, low-rise buildings and a well-kept sea front with fancy street lights on the promenade. 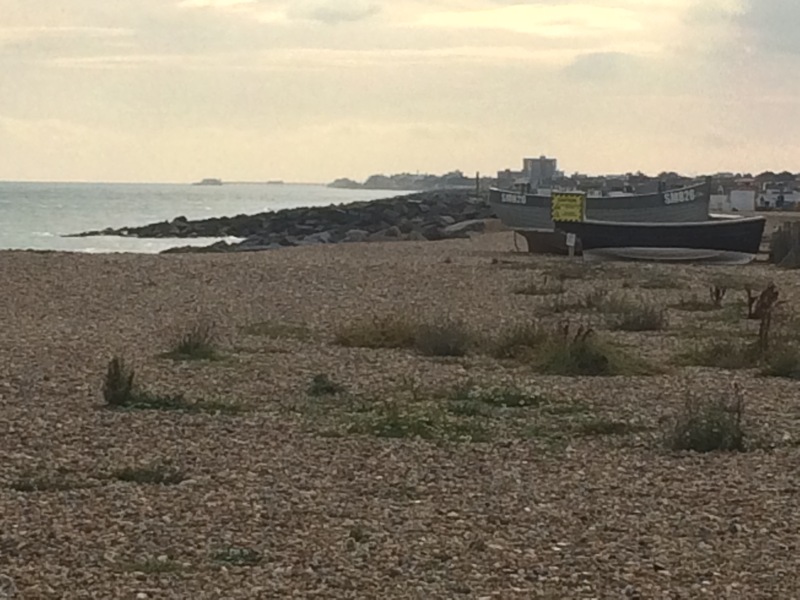 The Felpham sailing club seemed to be gearing up for some sort of regatta. 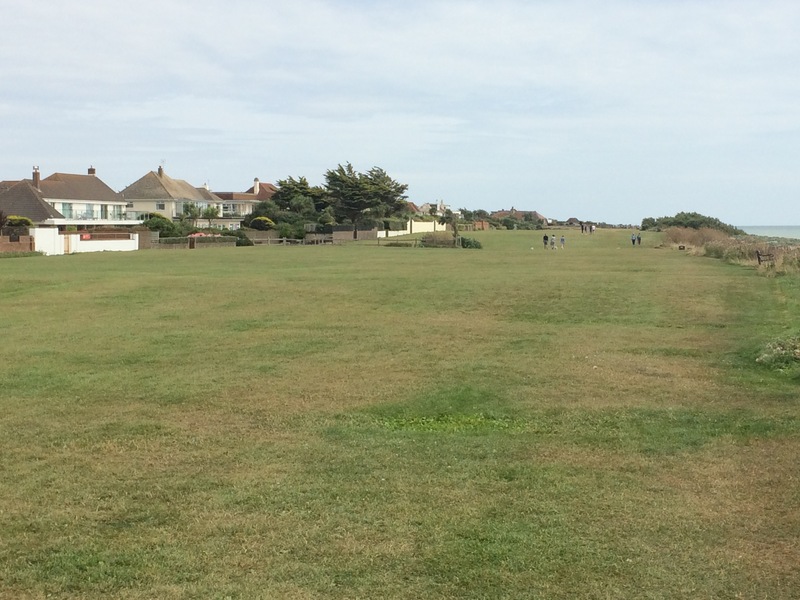 At Middleton-on-Sea I was back to walking along wide grassy strips of land sandwiched between enormous houses and the beach. These grassy areas are called greenwards and there seem to be a few along this stretch of coast, just as there are a few private estates with big houses. Something was bothering me about these big houses and I couldn’t work it out. Since West Wittering there have been lots of big houses. I guess I am now within commuting distance of London and the South East, so these houses are first- rather than second- homes. I can imagine there is a lot of one-upmanship that goes on, competing to have the best house. But there was something else. Somehow these houses seemed less connected to the sea than others further West. It was almost like being next to the sea just added value in the competition to have the best house. I couldn’t imagine anyone who lived in these houses worked on or near the sea, it was just there as a backdrop outside their enormous windows. It was just a feeling I had. Some beautiful houses though. It was very hot as I skirted inland to cross the River Arun at the pedestrian bridge heading into Littlehampton. On the way I stopped very briefly at Clymping Beach Cafe for a much wanted cold drink. 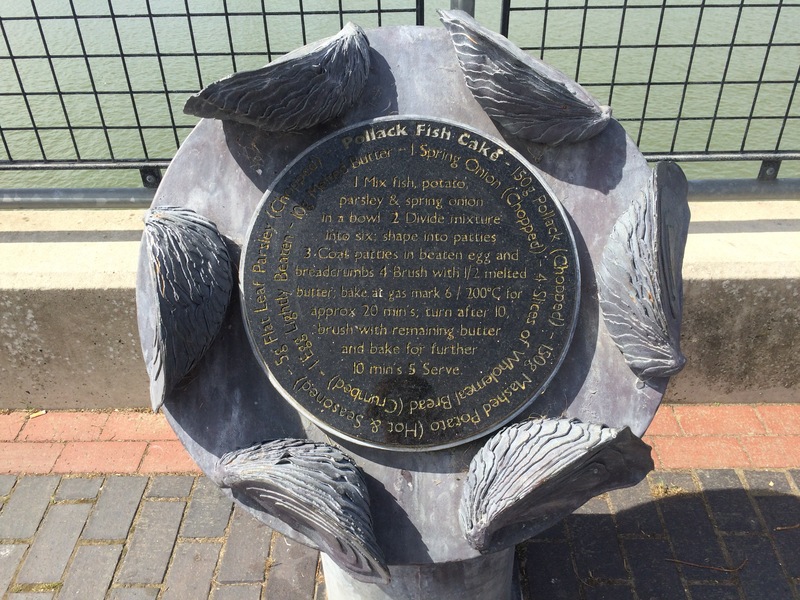 According to the map, Littlehampton really lies on the East bank of the River Arun; however, the town’s shipbuilding heritage was founded on the West bank. The Ropewalk seemed to be the only street on the West side and it was named after the rope-making factory that used to be there. 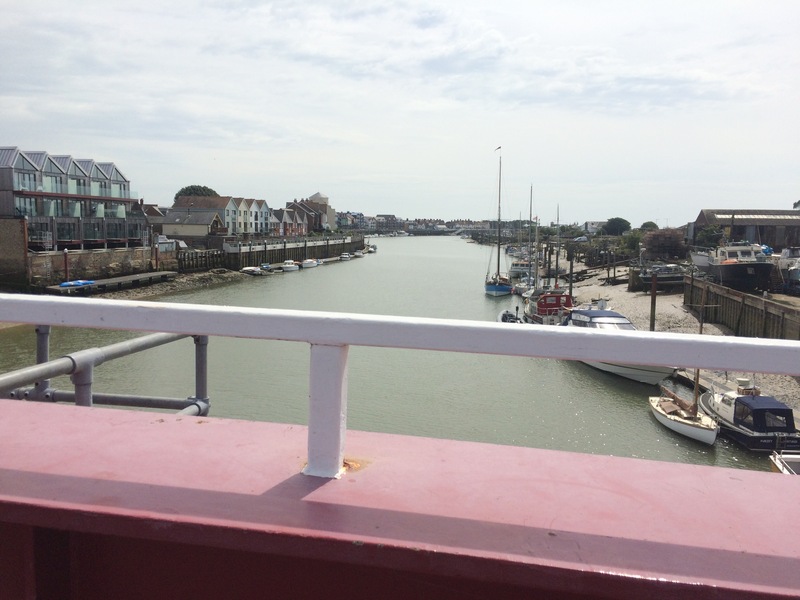 I crossed over the swingbridge to the East bank of the Arun and the main town of Littlehampton. 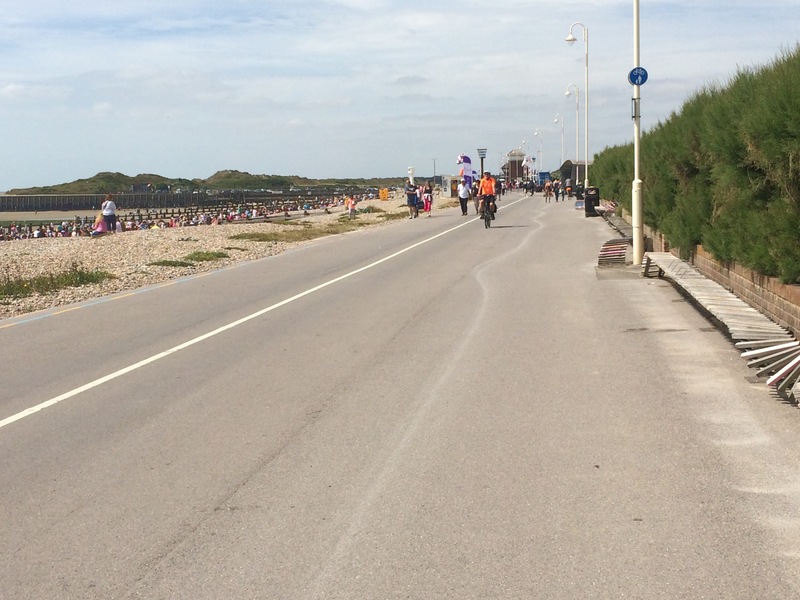 It seemed quite busy as I made my way to the sea front through the crowds. It seemed there was a sandcastle building competition in full swing on the beach. 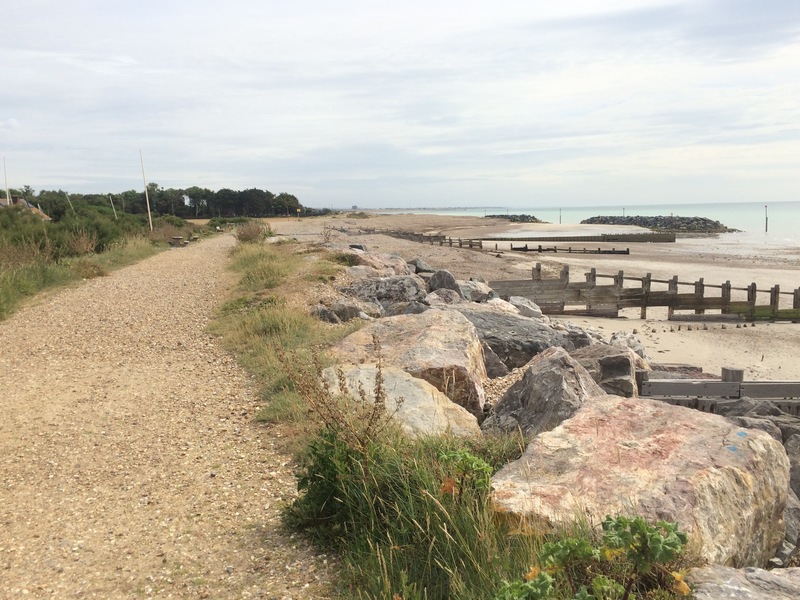 I started walking along the promenade, which took me past Rustington and on to West Kingston and Kingston Gorse. Yet more big houses here and I found myself walking along greenswards in front of them. 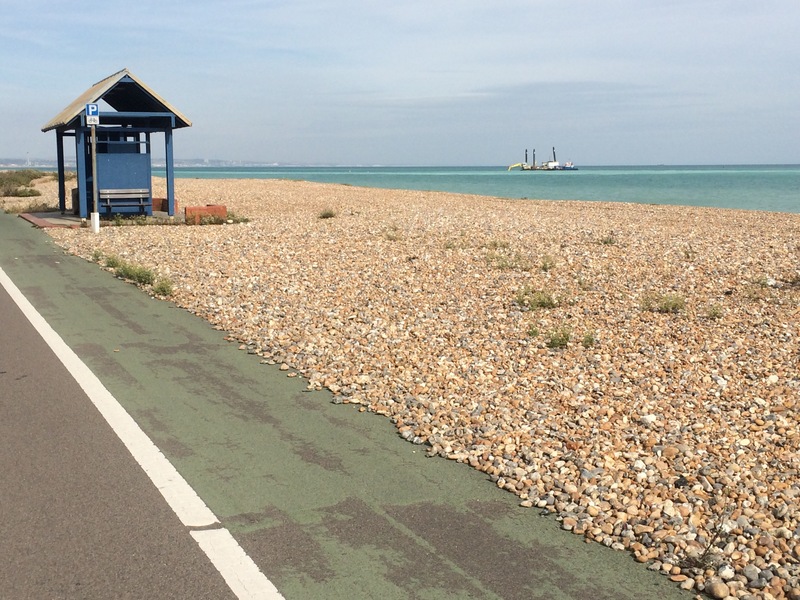 Finally, between Ferring and Worthing there was a gap; the Goring Gap to be precise. 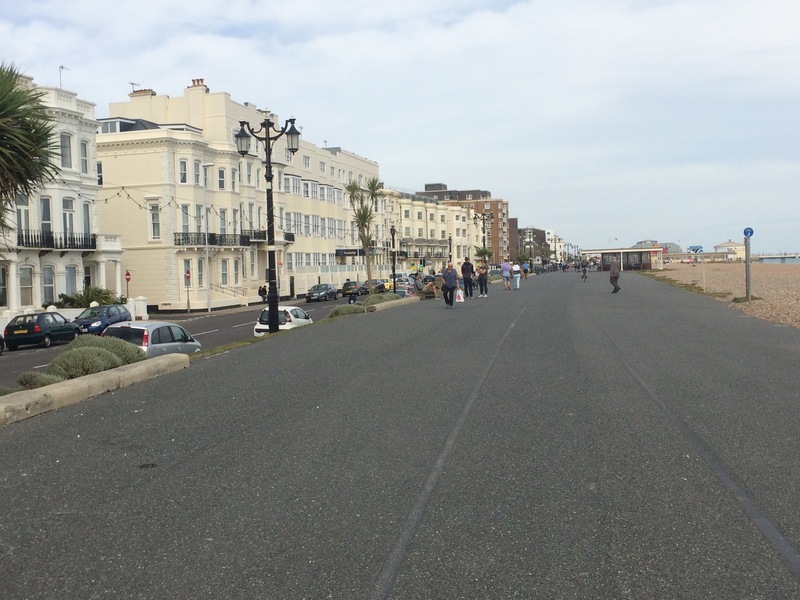 This narrow strip of land (and one other smaller one just after Worthing) was the only section of seafront between the River Arun and Brighton that was not built up. All the towns merge from one to the next. I had reached Worthing. 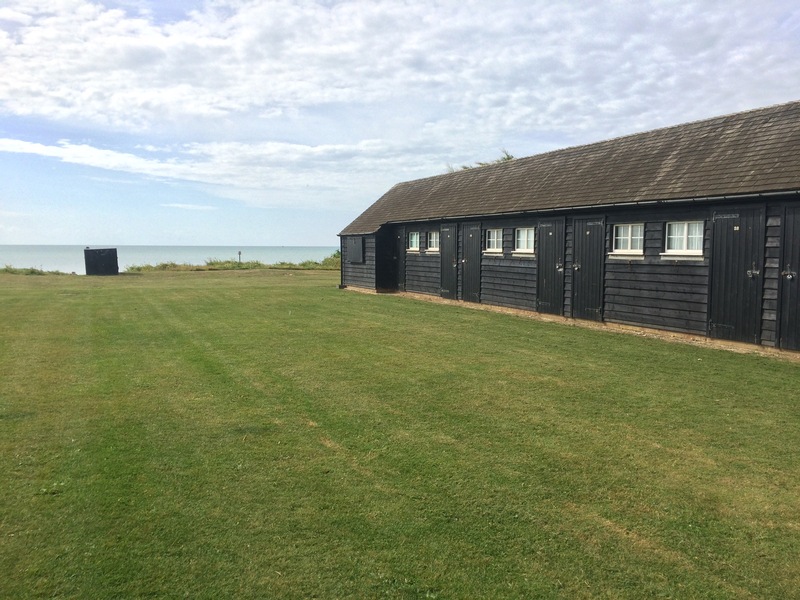 It followed the format for these South Coast seaside towns: shingle beach, wide promenade, big hotels, a pier. It must be a favourite destination for seaside coach trips as there were loads of coaches parked alongside the esplanade. 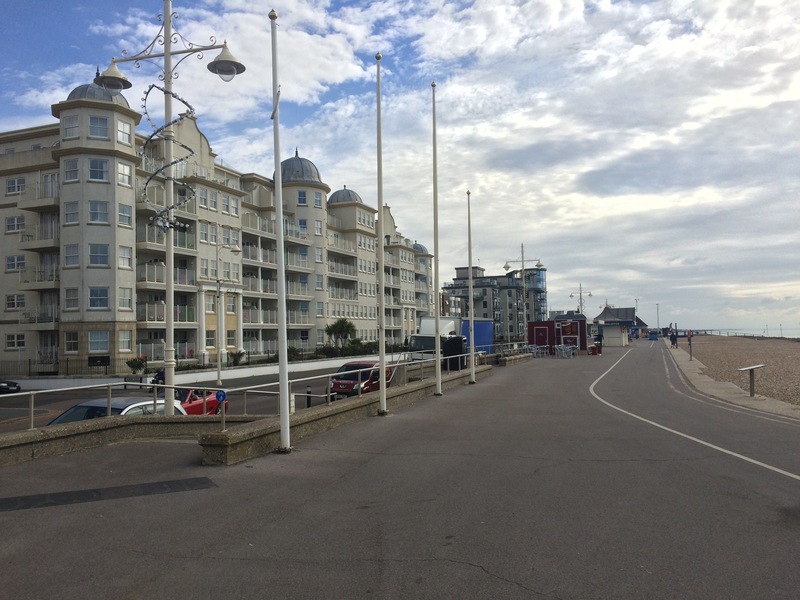 The activity of promenading began in Worthing after the esplanade was built in 1821. 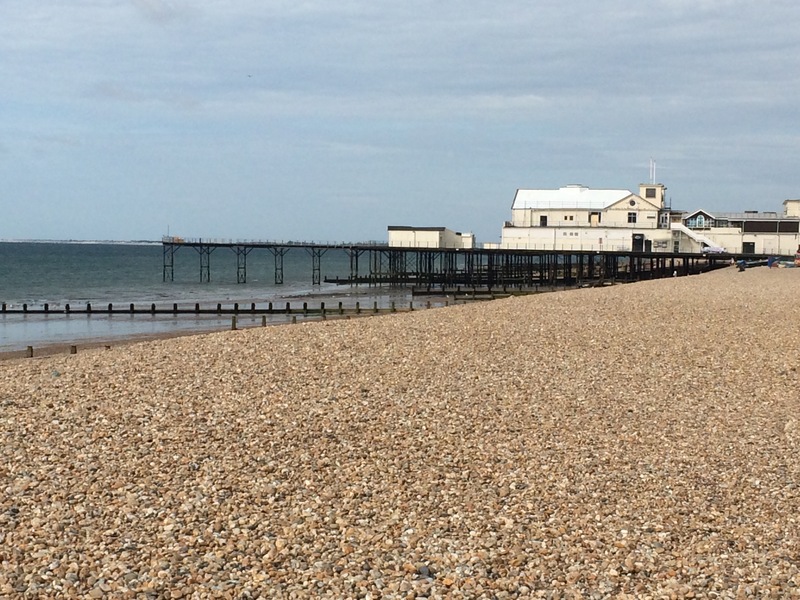 The pier distinguishes itself as having been “blown down, burnt down and blown up”. I was confused that the town has a lido, but it’s not a swimming pool it’s an entertainment centre. That was disappointing. 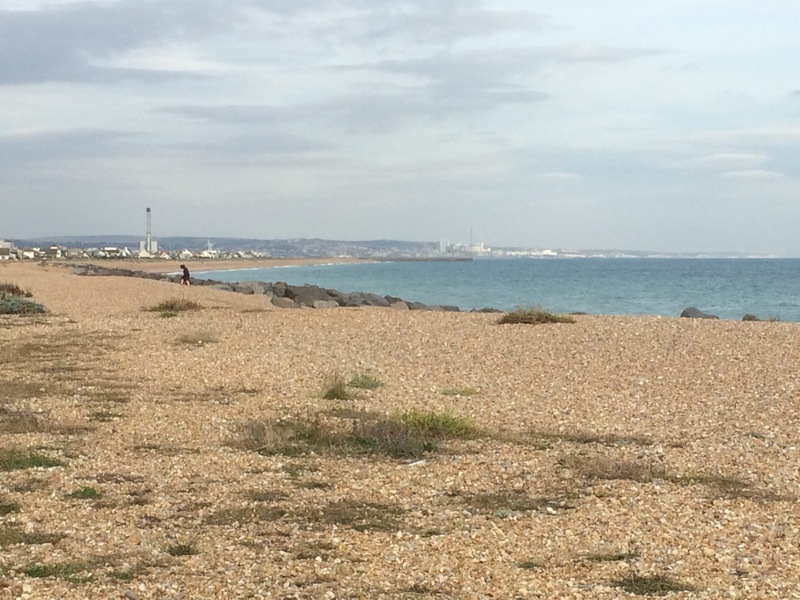 Next town was Lancing and then Shoreham-by-Sea. 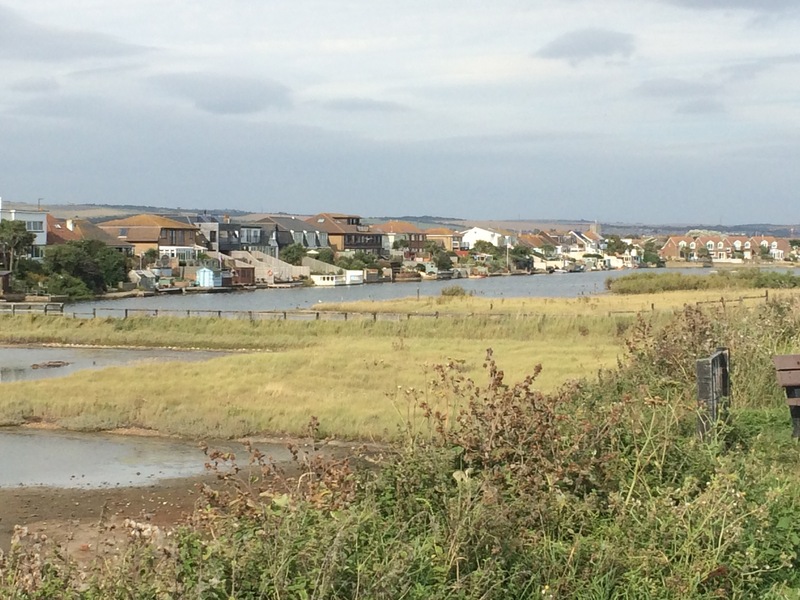 Just before Shoreham there is a set of lagoons and then the spit of land that is Shoreham Beach. 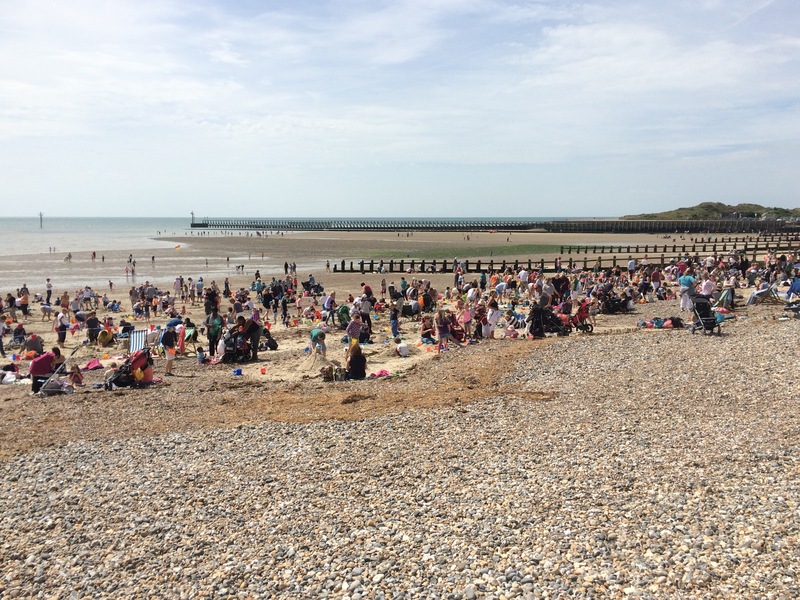 It is caused by the River Adur taking an abrupt left turn just before it reaches the sea and means that Shoreham Beach is split from the rest of the town. There was a big digger in the sea and the water around it had been churned up so that it was a really light green in colour. Quite striking. I asked a passer-by what the digger was doing and was told it was digging a trench for the cabling from the new wind turbines that were being installed further out off the coast. Apparently the opposition to the turbines has cooled somewhat as they are hardly visible (I couldn’t see them). I was exhausted so as soon as I reached the Church of the Good Shepherd, right on the edge of Shoreham, I phoned Sarah and she drove to collect me. I had a lovely evening being fed and pampered by Sarah and Phil. Eighty six miles in 4 days in the hot sunshine had worn me out! 20 miles….you were flying! I cant believe competitive Juice gave up the opportunity to enter a sand castle competition…….obviously had the bit between your teeth.